I’ve been very open about my love for the show Scooby Doo: Mystery Incorporated. I honestly think it is one of the best written cartoons I’ve ever seen. One episode in the second season (Dance of the Undead) introduces Rude Boy and the Ska-Tastics as the monster of the week. The back story is that Rude Boy and the Ska-Tastics were a one-hit wonder that failed to catch on. The group faked their own deaths in order to take a year off and write the perfect song. The perfect song actually took them 30 years and when they were ready to come back they realized the ska movement was dead. So they dressed as zombies and infused their music with voodoo to turn everyone that listened to them into dancing zombies. 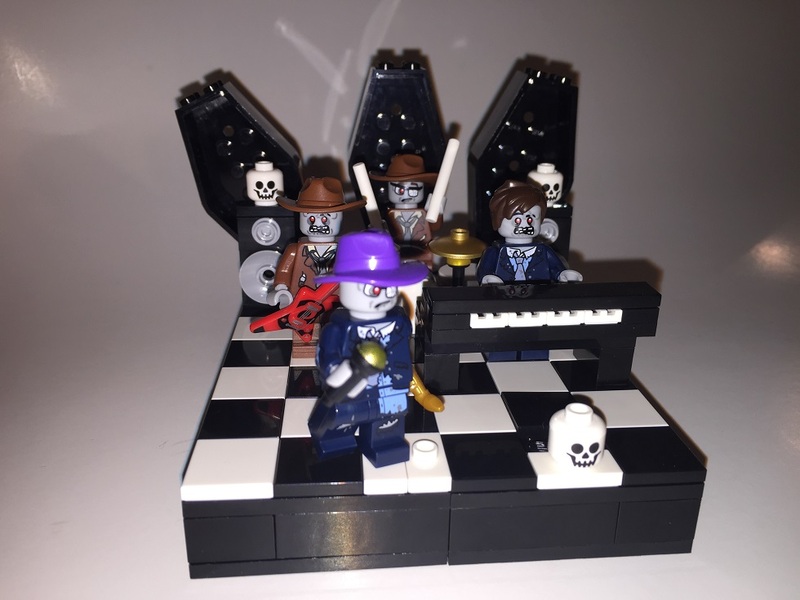 When the Scooby Doo Lego sets were released last year I immediately started thinking of other things from the shows that I wanted to see put into Lego form. Rude Boy and the Ska-Tastics were one of those things. The first thing I have to say about it is that the stage isn’t show accurate. In Dance of the Undead the band is playing on a rooftop with a large checkered banner behind them. I knew I’d never be able to do their logo correctly; so I did a checkered floor instead. I was able to keep the coffin backdrops, so I was pretty happy about that. I added a few skulls for some additional flair. It doesn’t look like a screenshot from the show, but I think it fits the characters. You’d have to really look closely at the picture to notice, but it also isn’t finished. Despite the big bags of Lego bricks I posted yesterday I’m still missing a number of tiles that I need to complete the stage. Those will be fixed after I make my next order. I somehow mixed up the drummer and the keyboardist in this picture, something that probably no one else besides me would ever notice. That one is an easy fix that will happen as soon as I finish writing this. 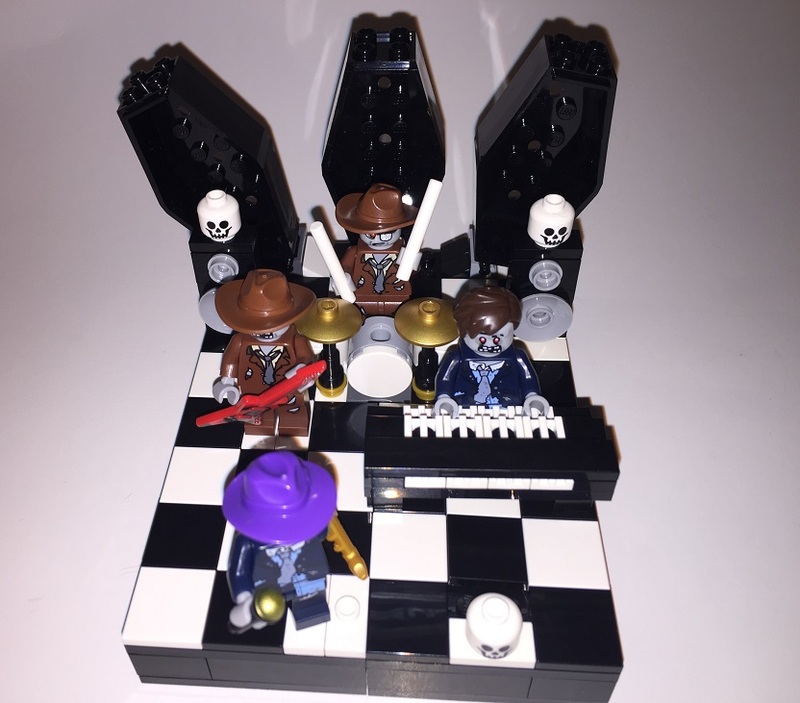 I'm pretty happy with how the band translated into Lego. Obviously there are repeated pieces between the band members. Sticking with official Lego parts didn’t leave me a whole lot of options to work with when I needed Zombies in suits. I was happy that I was able to get the two different heads and bodies to split up between the four figures. They really would have looked like clones if they all had the same head and clothes. This mini-Lego week continues tomorrow with another original build and then a Lego Flash Friday to end the week.